Tune in to ‘Secret Britain‘ at 9pm on BBC1 this evening. This evening’s episode is sub-titled ‘True North’. The BBC site writes: “Matt Baker and Julia Bradbury are on the road north on the third leg of their epic adventure to unlock Secret Britain. Even here, in the best loved areas of the Peaks and Lakes, there are still hidden corners of the countryside just waiting to be discovered. Julia takes a trip into the stunning underground limestone world beneath Yorkshire, while Matt relives childhood memories as he explores a secret ancient woodland on the Durham coast.” There’s apparently also a secret waterfall in the Lake District that features in the programme. The series has been getting some great coverage and viewing figures so far, so this is worth watching if you can but, if you miss it, it is also being shown on BBC HD tomorrow at 8pm and in the early hours of Tuesday at 1am. You should also be able to watch it on BBC iPlayer for a limited time after the programme has aired. Kendal’s Brewery Arts Centre has announced an Autumn and Winter 2010/2011 programme packed with all kinds of exciting events. It includes the world famous Kendal Mountain Festival which begins in September. Another early highlight will be The Brewery Theatre Company’s version of Two, written by Little Voice creator Jim Cartwright and directed by local luminary Judith Notley, which follows a pub landlord and landlady as they serve their regulars, with punters’ stories weaving together to form a moving production. A show by the Tibetan Monks from Tashi Lhunpo Monastery comes to town on 17th September 2010, hailed by The Times as “a psychedelic whirl of chanting, dancing, drums, cymbals and procession” – complete with jiving skeletons! Music-wise, there will be a broad range of acts that include Terry Callier (a collaborator with Curtis Mayfield and Mas-sive Attack), as well as the 80s hit band The Christians. Kendal Photographic Society’s Centenary Exhibition will take place in October 2010. And, as usual, there’s also a number of high-profile comedians coming to town, including Ed Byrne of Mock The Week fame. The Christmas season will see a production of Roald Dahl’s “Danny The Champion Of The World“, a children’s favourite that tells the story of Danny and his father’s fight to save their home from a powerful landowner. Going to sleep by counting sheep is more than possible in the South Lakes, particularly if you have feasted on some of the area’s wonderful farm-fresh food and drink. A wide variety of farm shops allow the visitor to eat in the from-field-to-fork way and get a true taste of the landscape in which they are staying, whether that’s for a picnic, or a self-catering night in. The number of hill farms and amount of fell pasture in the area make lamb a top choice for the dinner plate and no more so than at Mansergh Hall Farm, near Kirkby Lonsdale. Its lamb has been described as “the tenderest lamb you’re ever likely to eat” (Sunday Times, 2005) and its mutton has said to be “to die for”. The farm shop’s acclaimed lamb comes from lambs produced by breeding Texel Cross North Country Cheviot ewes and Texel rams and its taste and texture is outstanding thanks to it being hung for at least 7-10 days. The shop, open from 9am to 5pm on Fridays, not only sells lamb and mutton, but also retails quality, grass-fed beef, pork from a variety of free-range pigs, sausages, bacon and slow-grown, free-range chicken from Lowther Park Farms. An online shop is available for those unable to visit in person. The area’s famous Herdwick lamb is the speciality of Yew Tree Farm at Coniston (once owned by Beatrix Potter),which retails its own Herdwick through its Heritage Meats brand. Herdwick lamb has a truly unique taste, thanks to the rich diet of berries, heather and grasses that the little sheep enjoy, which makes the meat more flavoursome, tender and succulent. The cuts of meat are smaller than normal lamb and also contain Omega-3 fatty acids. A little thinking ahead can enable anyone enjoying a self-catering holiday in the area to order their award winning and acclaimed produce online and arrange delivery at a time to suit their eating-in evening. There are even recipes available online, to provide some inspiration! The Herdwick Hogget is a whole lamb, but there are also kidneys, mince, Lamb Henry, boned and rolled breasts, leg steaks, mini roasts and other joints from which to choose. A surprise meat hamper enables the shopper to also sample some of the farm’s Belted Galloway beef and a surprise! If pork is more to your liking, head to the Kitridding Farm Shop at Old Town, between Kendal and Kirkby Lonsdale. Home reared pork is available as joints, as cured bacon and as gammon, whilst it also helps to make the farm’s sausages renowned talking points. With home-bred beef and lamb and a variety of other local produce on sale, including Sue Prickett preserves, a visit on either a Friday (10am to 6pm) or a Saturday (10am-5pm), is a great idea. A few miles away, at Sillfield Farm Shop, near Endmoor, Kendal, Peter Gott’s wild boar, rare breed pigs, herdwick lambs and pedigree poultry are all free-range animals at the heart of some excellent meats that have wowed fans such as Prince Charles and Jamie Oliver. As well as selling meats, the farm shop has delicious hand-made pies and sausages available. Pie choices include wild boar, wild game (venison, pheasant, rabbit and wild boar), wild boar and cranberry and huntsman (wild boar, chicken and cranberry sauce, topped with stuffing). Sausage varieties include pheasant and venison, pork and garlic and wild boar with chianti and shallots, whilst gluten-free options include wild boar chorizo, lamb merguez and Toulouse (pork and beef). Sillfield Farm Shop is open from 10am-5pm on Fridays and Saturdays and from 10am to 4pm on Sundays. At Low Sizergh, near Kendal, the Low Sizergh Barn Farm Shop is housed in a seventeenth century Westmorland stone barn and sells everything from its cool, creamy milk, to vegetables delivered by wheelbarrow from its Growing Well social enterprise scheme on Low Sizergh Farm land. 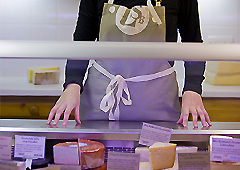 The farm’s milk is also used in its Kendal Crumbly, Kendal Crumbly with Red Onion and Kendal Creamy cheeses, sold on its award-winning cheese counter, offering over 60 choices. Low Sizergh Barn is a silver ‘Taste of England’ award winner in the 2010 Enjoy England Awards for Excellence, which recognises its approach to sourcing other local products, as well as using its own. Other award-winners stocked at the farm shop include Kendal Jacksmiths flapjacks, whilst a new local product on the shelves is the Bedrock Gin, made using Lake District spring water. The shop is open every day from 9am to 5.30pm. The Plumgarths Farm Shop offers shoppers its own premium brand lamb and beef, as well as pork from rare breed Saddleback pigs and farm veal from Heaves. With free-range bacon, sausages and other local products, including chutneys and relishes, this shop, located on the Lakeland Food Park, is another place to head to for excellent local produce. The shop opens from 9am to 5pm Monday to Saturday and is online continuously. Succulent and tasty meat requires suitably fresh and flavour-filled accompaniments – food that is the speciality of Howbarrow Organic near Cartmel – an online shop for organic vegetables, herbs and fruit grown on its own land, as well as a variety of other local produce, ranging from shellfish to butter and from mutton to smoked fish. With special vegetable boxes and welcome packs available, as well as quirky choices such as a de-tox box, this is an online shop that will soon be supported by an offline farm shop once again. Whilst in the Cartmel area, it would be rude not to pick up some of the famous Sticky Toffee Pudding from the Cartmel Village Shop. The acclaimed Sticky Toffee Pudding comes in a variety of sizes and has sister products – Sticky Ginger Pudding, Sticky Banana Pudding, Sticky Chocolate Pudding and accompanying sauces. Add to this a classic twist on a traditional summer fruit pudding – packed with raspberries, redcurrants, blackcurrants, strawberries and elderflower cordial – and a visit is a must! Nearby Holker Food Hall is the place to which to head for the famous Holker Saltmarsh Lamb, with its distinctive flavour influenced by the grazing of the sheep on the saltmarshes around Morecambe Bay. This is joined on the shelves by Morecambe Bay Potted Shrimps and other delicacies such as St James Ewe’s Sheep cheese from the Holker-based dairy of Martin Gott, local apple and damson juice and Holker venison – from a herd with a bloodline stretching back centuries. The Food Hall opens from 10.30 am to 5.30 pm daily in the high season and to 4pm in winter. Local producers markets will also be held from 10.30 am to 3.30pm, in the Courtyard at Holker Hall, on 5th September, 6th and 7th November and 5th, 12th and 19th December 2010. Another farm shop selling meat flavoured by the rich Furness pastures around the Cumbrian coast is the Baycliffe Farm Shop near Ulverston. Quality and choice cuts of beef and lamb are sold alongside home-cured bacon and home made sausages, as well as a secret ingredient black pudding. The innovative farm shop also sells its own Chicken Cushions, Farmhouse Roasties, Lamb and Leek Roast, delicious pies and creamy custard vanilla cake. It opens from 9am to 3pm Tuesday to Friday and from 9am to 2pm on Saturdays and also sells its produce at nearby Ulverston market. Foraying into the feast of food available from the South Lakes’s farm shops is a fabulous way to really understand the landscape of the Lakes, so put a shopping spree on your must-do list during your holiday in this stunningly beautiful area, which produces simply outstanding food. If you thought Lowry’s works could only be seen in Salford, or that this renowned artist only painted pictures of crowds of people in urban settings, head to Kendal and feast on a brand new exhibition, ‘The Loneliness of Lowry’. The Abbot Hall Gallery is showing the first major solo exhibition of Lowry to be on view outside of Salford in the last five years. The artist travelled extensively in the North West as many of the works demonstrate. 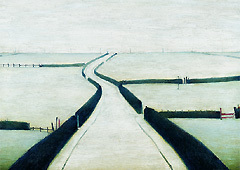 Compelling seascapes, including The Empty Sea (1945), Seascape (1952) and The Grey Sea (1963), are joined by various dramatic landscape paintings featuring mountains and lakes, depicting scenery from around Cumbria. Lowry claimed none of his paintings would have happened had he not been lonely. This exhibition, with its stunning landscape paintings, its vacant seascapes, moving portraits and quirky works such as Man Lying On A Wall (1957) and Man With Trilby Hat, draws on the loneliness theme in a truly moving way. Many of the Lowry works are rarely accessible to art lovers, as they come from private collections, including those of London’s Crane Kalman Gallery. The opportunity to view these paintings, and other fabulous works, is not-to-be-missed. The exhibition runs until 30th October 2010 and admission costs £5.75 for an adult and is free for children up to the age of 18, or age 25 if in full time education. It is open from Monday to Saturday, but closed on Sundays. The second Kendal Festival of Food will be held from 22nd to 29th October 2010. Last year’s inaugural festival was a huge success, but this year’s event is expected to be bigger and better, with even more food producers, farmers, restaurants, cafés and food suppliers taking part over the eight days. The festival takes place at locations across Kendal and its surrounding area, with some open-air events staged in the market square. Participating businesses each decide how they wish to dynamically promote their food, drink or dishes. Last year, the activities ranged from hands-on sausage making sessions to fascinating talks and demonstrations and from price offers to children’s kitchen capers. Food sampling is the essence of the Kendal Festival of Food and with fantastic tasting local fish, game, organic vegetables, home-reared meat and artisan cheeses on offer, the public find it hard to resist a culinary voyage through different taste sensations. This is an opportunity for those who have never tasted Herdwick lamb, or sipped damson gin, to treat themselves to new food and drink experiences. The area is known for delicacies such as gingerbread and Cumberland sausage, but also home to award-winning cheeses and of course the world famous Kendal Mint Cake!